I swear I steamed this top before we took photos. The wind for some reason made it appear wrinkly and the seatbelt must have wrinkled it up a bit. Ugh, this bothers me A LOT especially since I know I took my time steaming that top. Whatever. Anyways, let’s talk about this top. Yes, I know another bell sleeves top. I’m obsessed! And to think when I first saw this trend, I was hesitant about it. Now, it is like almost every post has bell sleeves haha. I love this particular top because of its ‘casual yet chic’ look to it. 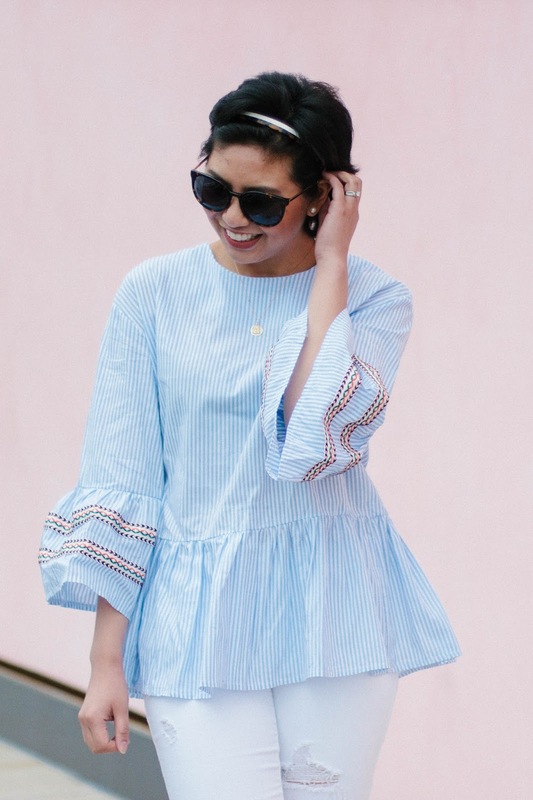 I love the solid blue and white stripes with a touch of embroidery on the sleeves to give it a subtle boho chic style. What makes this top fun is its peplum, drop-waist style. It just makes it feel more Springy. Want to know what surprised me the most about this top?! My husband really liked it. When I put it on, he was complimenting it. Don’t get me wrong, he is a sweet man but let’s be honest, guys don’t really understand fashion trends. Sometimes, he doesn’t know what to say about some of the stuff I wear. So for him to compliment a top that is such a statement says something! What about you guys? Do you think your husband/boyfriend/significant other would compliment a top like this? I have this top too and LOOOVE it! I really like how you paired it with heels! I'll have to try that next time I wear it! Oo I can't wait to see how you style it! This top is so cute! I love the bell sleeves with the embroidery details…very pretty! 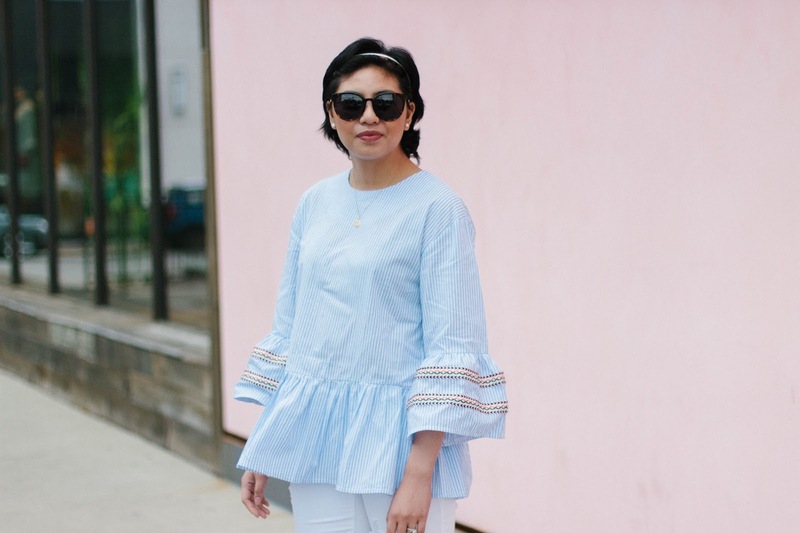 I cannot get enough of bell sleeves and ruffles lately! So cute. It looks like the perfect piece to take on vacation! Such a pretty top on you, babe! Such a pretty Spring top! Love it!!! I was hesitant about the whole statement sleeves trend as well, but I guess I am convinced it looks great the more often I see it. Oh yea it definitely is! You looks really cool dear! Have a lovely day! I totally agree that men really don't understand fashion trends!! 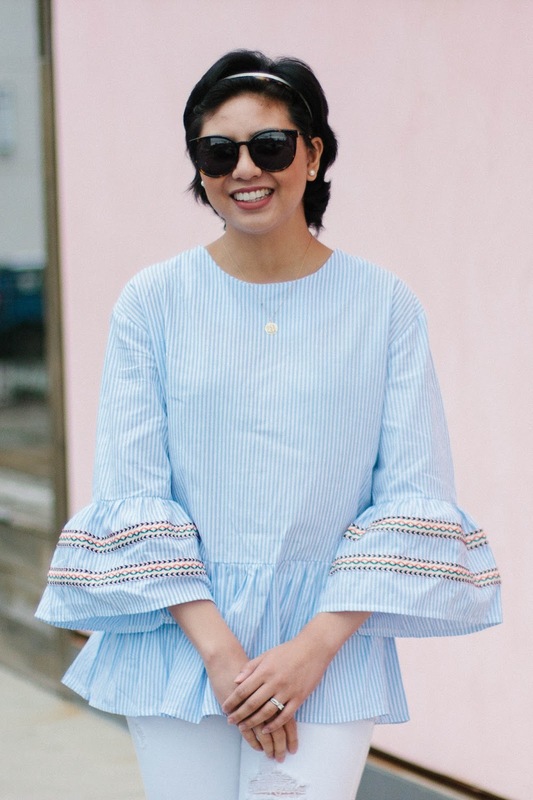 I have a similar bell-sleeved top that my boyfriend thinks I look cute in but overall he doesn't understand the point of having such big sleeves (haha)! haha I know, they're just so funny!! I didn't even notice it has a resort look to it! Oo def want to wear it on vaca haha! Oh my gosh! So So So obsessed with these sleeves! So cute I can hardly handle it! Such a cut outfit and love that top! 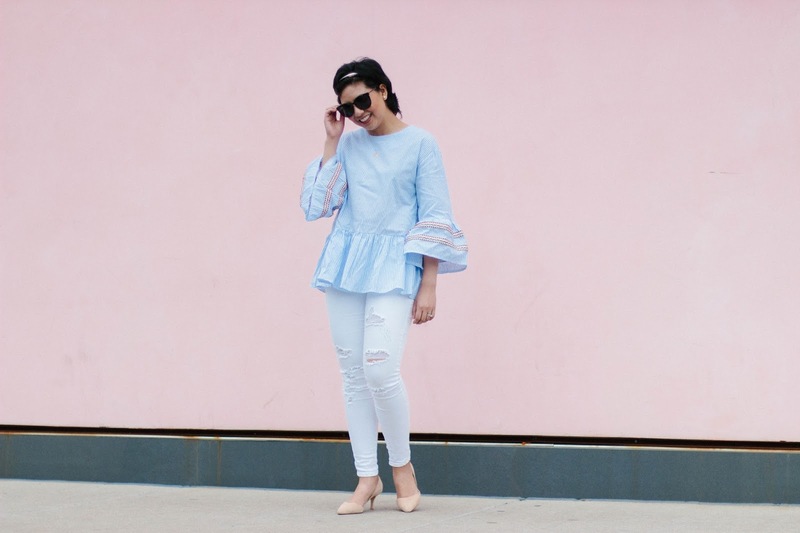 Loving all the bell sleeves for spring! 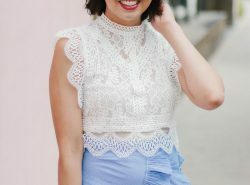 This top is straight up DREAMY, lady! Me chifla el look, fino e informal a la vez y con ese azul tan precioso. 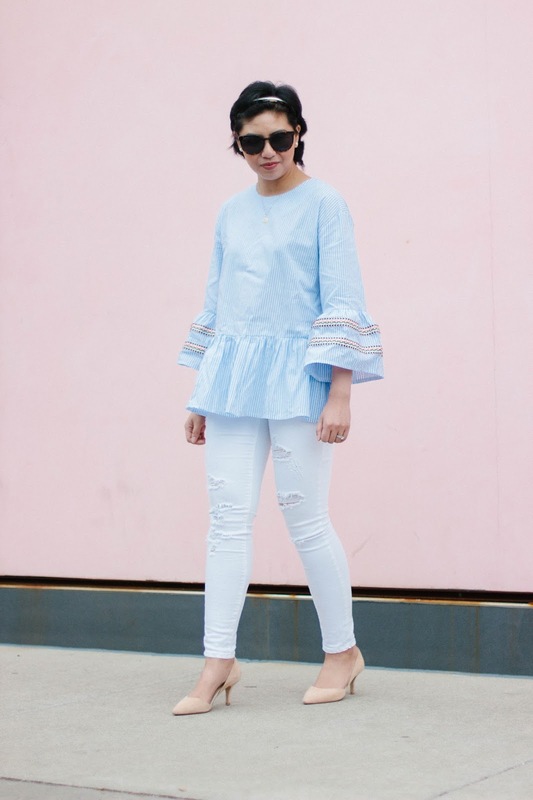 This is the perfect bell-sleeved top for spring!! I love the drama!! It's darling. That top is seriously so adorable, and looks great with white jeans! 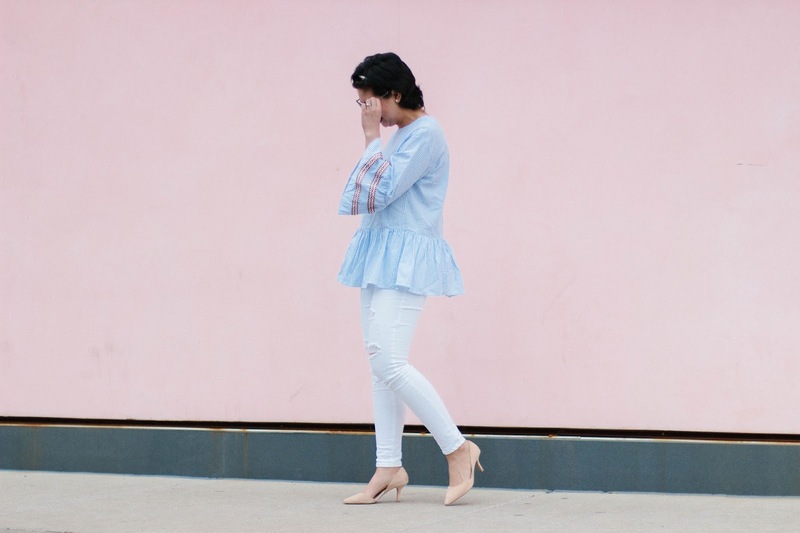 And I'm totally with you one loving bell sleeves – I can't get enough! I love this top rach and it goes soooo well with the pink wall behind you. So pretty. You are looking so beautiful dear, so amazing combine! How chic do you look??? I am obsessing over those sleeves so fun and so so chic! I think i have said this before but I love your smile. This outfit is too cute. Perfect. I just love this top! And it looks amazing with that pink wall in the background. 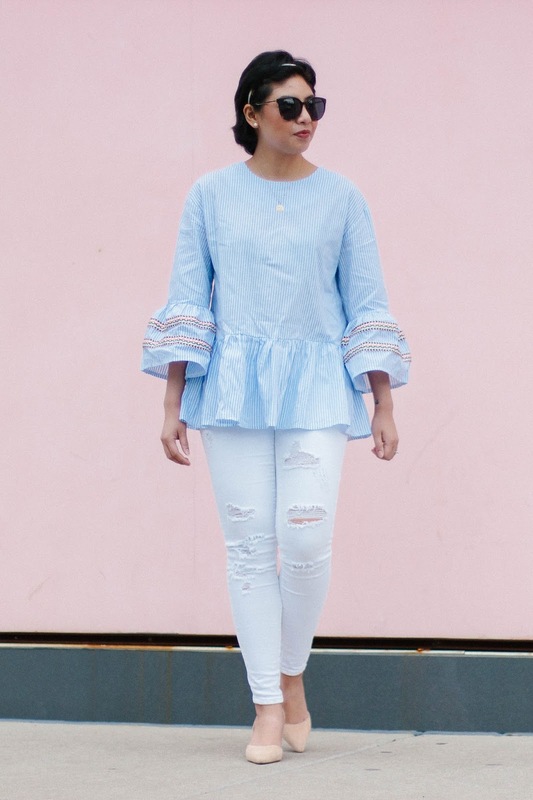 After seeing your post I feel like I need a top with bell sleeves in my life. This top is so cute! I love bell sleeves trend so much. that is a great top for spring! That color combination is so soft to the eyes. I always think it's cute when my hubby appreciates fashion too! I actually just ordered this top! hehe Love how you styled it! The top is so cute! Love the colour. That top is really cute so I can see why he complimented you on it! Sometimes I feel like we dress for ourselves or other women, not for men. Nevertheless, this is a super cute outfit! Bell sleeves are amazing, right? It probably won't go away soon since it's so easy to wear to elevate an outfit. I am loving the extra details on the sleeve of yours! I need this top is just amazing on you gorgeous, I adore the pink details and the jeans are super chic. I hope you have an incredible week! I LOVE the bell sleeves trend!! You look wonderful (and I totally didn't even noticed any wrinkles on the top)!! This top is so cute ! Love the color ! Lovely top, it goes so well with the pants. Hello, Rach, it is wonderful to meet you! This blouse is just the cutest and is perfect with your white distressed jeans. And your top didn't look all wrinkly. 😉 Thanks so much for linking up with Fabulous Friday! I hope to see you back this week.